The activities of the Shukhov Tower Foundation for the development of science, culture and art are aimed at the promotion of scientific and engineering achievements, the traditions of education, culture and art, at the realization of social projects and the preservation of heritage of the Great engineer, inventor and scientist Vladimir Grigorievich Shukhov . The main fields of V.G. 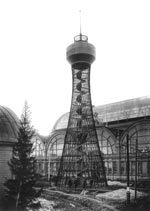 Shukhov's creative work were the invention and creation of the equipment for oil industry, the steel building structures and heat machines. V.G. Shukhov was the author and technical leader of the construction of the first oil pipelines in Russia, the inventor of the world's first industrial plant for oil cracking, world's first steel hyperboloid towers, lattice shells, hanging steel lattice overhead covers, tubular steam boilers, air lift, black oil burner. The full list of the Great engineer's developments takes dozens of pages. V.G. Shukhov was a many-sided person and his creative works were not confined just by technical achievements. He was keen on theatre, sport and art photography. The heritage of the Great master is alive as long as it is used by the new generations. The theoretical and practical development of the oil hydraulics fundamentals and the construction of pipeline systems, stated in the works of V.G. Shukhov, is used until now during the construction of trunk oil pipelines. Today the development of modern technologies of gasoline production and of the plants for oil cracking has gone far ahead, but many elements first invented by V.G. Shukhov remain the basis of their structures. New hyperboloid towers were recently built in Japan, Czechia, Spain and Switzerland. The architect Ken Shuttleworth designed the three hundred meter hyperboloid skyscraper "VORTEX" that is to be built in London. Nowadays, the heritage of V.G. Shukhov in the construction of the unique hanging and lattice shells structures is developed by the architectural schools of Frei Otto and Norman Foster. These structures are widespread in the modern European and Japanese architecture. The Foundation's ideology and values, its goals, tasks and program correspond with the ideology and many-sided activities of Vladimir Grigorievich Shukhov and with the topical problems of science, culture and art of our time. The preservation and promotion of V.G. Shukhov's heritage, the initiatives for the preservation of Shukhov's structures in the regions of Russia and CIS, the cultural and socially significant projects in small towns of Russia and the creation of Shukhov center in Moscow may be considered among the Foundation's main current tasks. The Shukhov Tower Foundation invites the interested parties for the mutually beneficial cooperation to realize joint projects.